Managing an event can be overwhelming, but don't worry - we're here for you! From full-service event management to communications & marketing assistance, our event support team is ready to meet your needs no matter the request. For rights holders who think big, Dallas is the host city that creates legendary experiences. Our passion for sports of all kinds coupled with a strong heritage of iconic athletes, events and innovative sports leaders provides the foundation you need for a successful event. 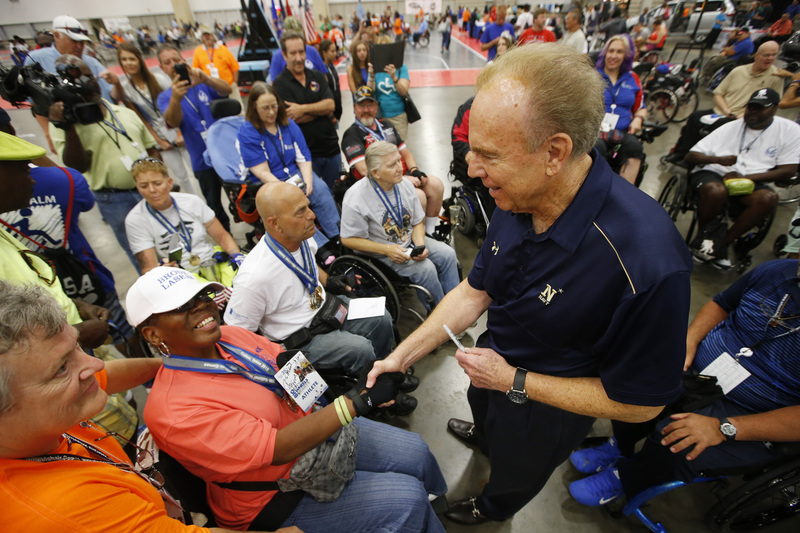 Dallas Cowboys legend and U.S. Navy veteran Roger Staubach greets athletes at the 35th National Veterans Wheelchair Games in June, 2015. The Dallas Sports Commission sales team is poised to showcase all Dallas has to offer for your next tournament, championship, meeting or convention. Securing the right facility, hotel block, vendor services and community support is the foundation for a successful sports event. From grassroots initiatives to international competitions and everything in between, the Dallas Sports Commission sales team leverages years of experience and relationships to deliver the most competitive proposals and approaches every event as a partnership. Our mission is to lay the groundwork for a great experience that our team and our city can deliver from start to finish. Your event journey begins with a call to the Dallas Sports Commission sales team. What makes Dallas the perfect destination for your sporting event or meeting? To learn more about the great dining, shopping and attractions that Dallas has to offer, please go to VisitDallas.com for more information. Let the Dallas Sports Commission sales team find the right venue and solve your hotel needs to help make your event memorable for you and your guests! For more information please contact Ginger Lively-Cade at ginger@dallassports.org. We'll help you find volunteers for your event with our database of over 10,000 people. You'll also receive free access to our robust volunteer management software. Your guests will feel welcomed from the start! From event signage to airport host hotels to attendance generating promotions, we can customize a welcome package that's right for you. We partner with local restaurants, attractions, and shops so we can offer you special discount programs. Need equipment rental and services? We'll supply unlimited access to our database of service providers. We've got your pre-visit covered too: We will facilitate all the necessary arrangements for your visit to Dallas for site inspections of hotels, competition venues and off-site venues. Looking for a special event venue or private dining information? We can connect you with a wide variety of venues and locations. The Dallas Sports Commission is committed to working with your staff to prepare a comprehensive post-event report complete with hotel pick up, facility reviews, economic impact projections and staff evaluations. To learn more about our event operation services, please contact Stephanie Evans at sevans@dallassports.org. We'll help you spread the word! Our marketing & communications department assist you with press releases, media advisories, local media outlet lists, story pitch ideas and more. We can also help build awareness for your event through grassroots outreach. You won't get lost with us - we'll create a custom map of Dallas hotels in your housing block. Our online photo gallery can help you to promote Dallas to your attendees as well as provide photos of your event. We'll put your logo and event listing on the Dallas Sports Commission event calendar for free! We've got plenty of reading material for you, if you need it. Visitor Guides, maps, meeting professional's guides and additional Dallas promotional literature is available for pre-planning and onsite distribution. We can create local activity announcements that can be used before and during your event. For more information on marketing & communications services, please contact Larry Kelly at larry@dallassports.org.